Johnston, Frances Benjamin,, 1864-1952,, photographer. 1 photograph : glass lantern slide, hand-colored ; 3.25 x 4 in. Notes: Site History. House Architecture: James Hoban and others, from 1792. Landscape: Beatrix Jones Farrand, planted fall 1913; Charles Henlock, head gardener. 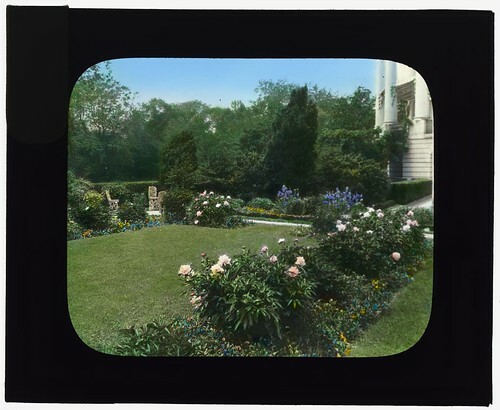 Other: Garden designed for Ellen Axson (Mrs. Thomas Woodrow) Wilson. Beatrix J. Farrand. Today: Garden not extant. Forms part of: Garden and historic house lecture series in the Frances Benjamin Johnston Collection (Library of Congress). Oh, I just love gardens of every type. Thanks for sharing.